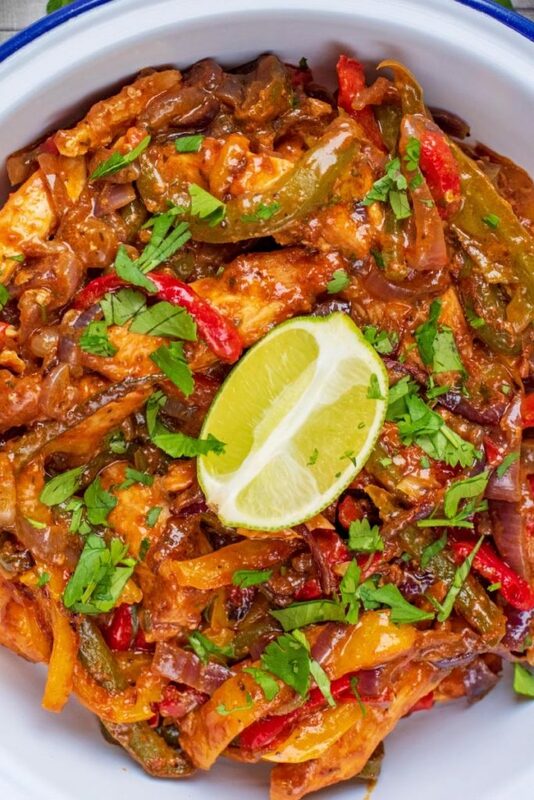 Chicken Fajitas are a family favourite and great for feeding a crowd. They have just gotten easier, as these Oven Baked Chicken Fajitas are all thrown in to one pan and cooked in the oven. No need to stand over the hob – just let it cook away in the oven whilst you get all the accompaniments ready. Guac and Salsa deserve your attention too! Who doesn’t love a dinner where you can throw everything in to one pan and cook it in the oven? It means less washing up, which is always good with me. If you are trying to get dinner cooked whilst looking after the kids, then you want something that you don’t have to look after and keep stirring. I find making fajitas on the hob means they need constant attention and stirring so they don’t stick and burn. These look after themselves in the oven and stay deliciously moist. Chicken fajitas are a classic, but you don’t have to use chicken in these. You could keep them vegetarian and add some extra veggies like courgette and broccoli or even some tofu. Or, you can use king prawns of steak strips for a change. Cooking times will vary, but it’s a great way to change things up on fajita night. You can buy fajita seasoning in a packet, but it’s usually loaded with extra sugar and salt. It’s really easy to make yourself, and then you can make a big batch and keep it in a jar for whenever you make fajitas. We like to sprinkle it on salmon before grilling too. 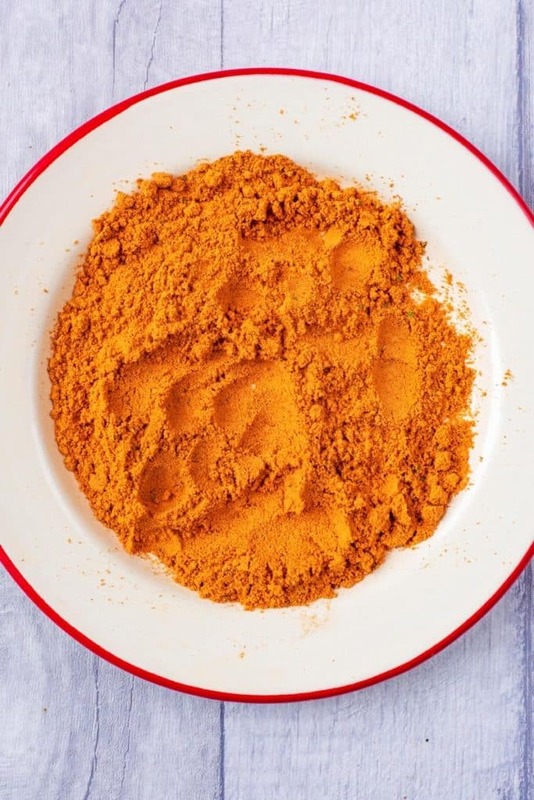 We mix together 1 tbsp chilli powder, 1 tbsp smoked paprika, 1 tsp garlic powder, 1 tsp onion powder, 1 tsp cumin, 1 tsp ground coriander, a pinch of sea salt, black pepper and sugar. Can You Make Baked Chicken Fajitas in Advance? These Baked Chicken Fajitas are best made in advance. Not only to save you time, but to allow everything to marinate. Put all of the ingredients in to a bowl or a zip-lock back and put in the fridge for at least 2 hours – but overnight is preferable. This will allow all the flavours to really come alive. Making these ahead of time makes them the ultimate easy family dinner, as you can just throw them in them in the oven when everyone is ready to eat. 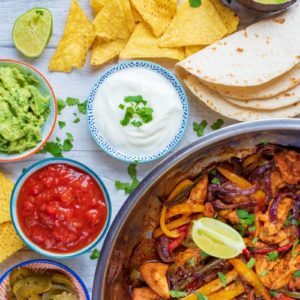 What To Serve Chicken Fajitas With? You could just serve this on top of rice, but where is the fun in that? 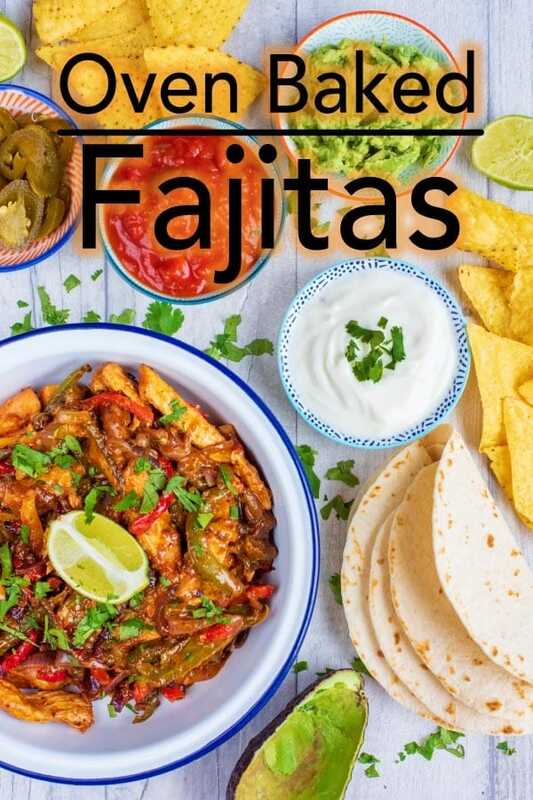 Go all out with these fajitas and serve them with tortilla wraps, homemade salsa, guacamole, sour cream (or yoghurt for a lower fat alternative), jalapeños and some tortilla chips on the side. A pinch of sea salt, black pepper and sugar. Two: Mix together the seasoning. Three: Put the chicken in a large bowl with the oil, chopped vegetables and seasoning and mix well. Put in the fridge for at least a couple of hours, but preferably over night. 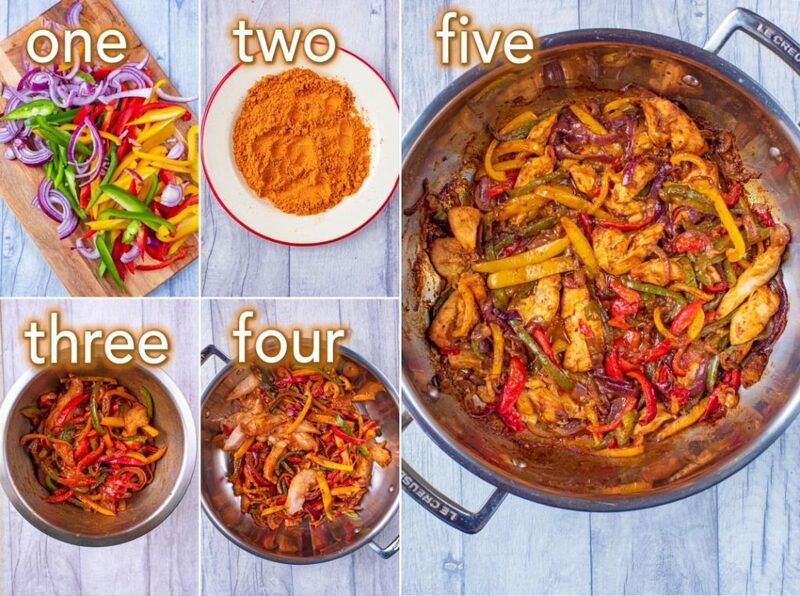 Four/Five: Add the chicken and vegetables to a large oven-proof pan and put in a preheated oven at 200°C for 25-30 minutes, until the chicken is cooked through. Six: Squeeze the lime over the cooked dish and sprinkle with coriander. Serve with wraps and toppings. You don’t have to use chicken in this. Swap the chicken for extra veggies, or use tofu, king prawns or steak strips. 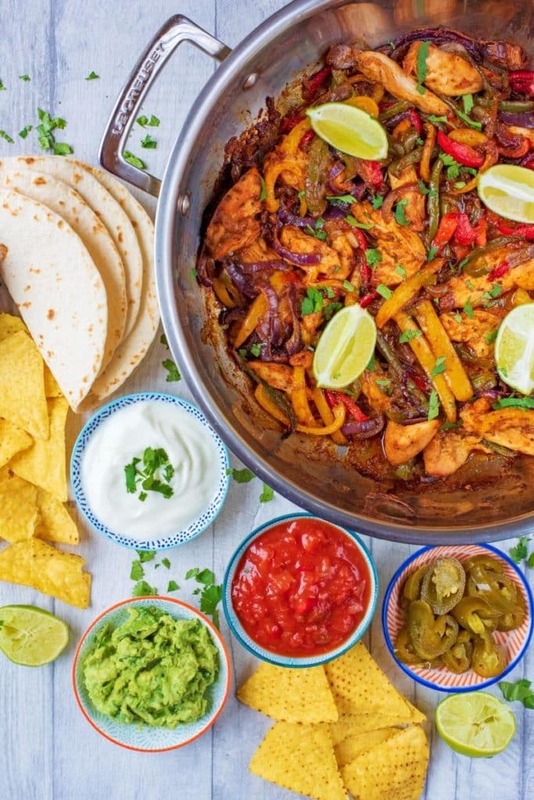 Do you want to be kept up to date on more delicious posts like these Oven Baked Chicken Fajitas? Please subscribe to the blog mailing list (it takes 30 seconds). 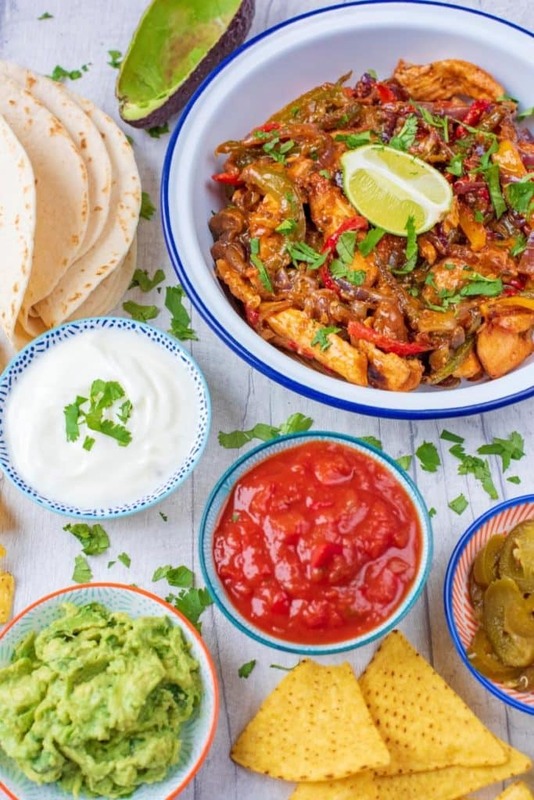 If you’ve tried these Oven Baked Chicken Fajitas, or any other recipe on the blog, then let us know how you got on in the comments below, we love hearing from you! You can also FOLLOW US on FACEBOOK, TWITTER, INSTAGRAM and PINTEREST to see more delicious recipe ideas, behind the scenes shots and also what we are getting up to. What veggie protein would you use to replace the chicken? I’m so happy I found your blog on Pinterest. 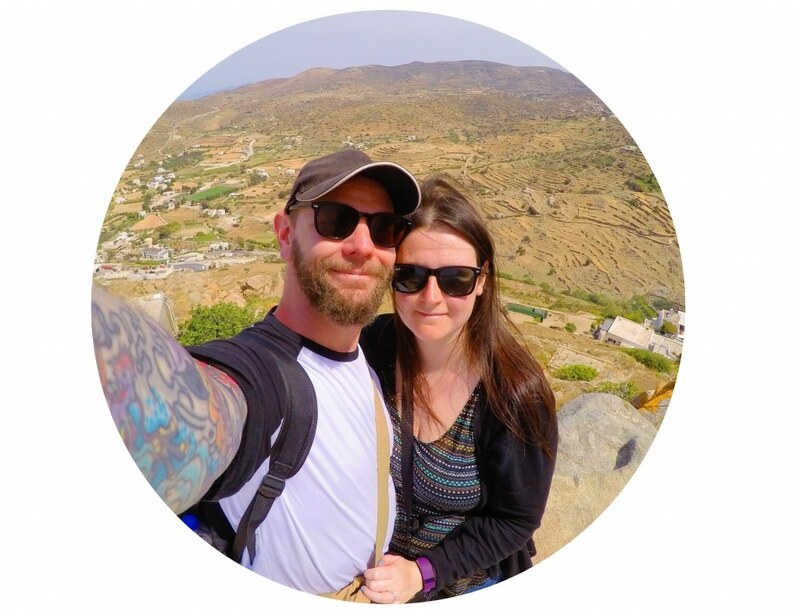 Your story is inspiring and I am hoping your blog is just what I need to lose the weight I have been trying to lose for so long. Do you have any other one pot recipes? I had a baby 8 weeks ago and anything that limits the cooking and cleaning is much needed at the moment. I have been making lots of your recipes recently and not only are they saving me time, but they are helping me to shift the baby weight too. We made these last night and they were delicious, but not spicy enough for us. We added some chopped jalapeños in to the wraps and skipped the sour cream and they were just right. Thanks for posting the recipe. This is my favourite Mexican dish, but I have always done it in the frying pan. I suppose it is healthier this way? Thanks for the tip. That salsa looks really good. Do you have a recipe for it? Where do you get your tortillas from? Or do you make them yourself? I made these last night Dannii and they were so, so good. I can’t believe how easy they were to make too. I love one pot meals – anything where you get less washing up! Probably a silly question but do you cook thw chicken first? Thanks! I can’t believe I’ve never made fajitas before. This is definitely going on my ‘recipes to try’ list. These look yummy and simple. Thanks for sharing. These chicken fajitas sound delicious, Dannii! I’ve never made my own before, so I definitely have to try out your recipe. My husband would absolutely love this! We love fajitas at our house! These look so delicious! I like the spice this punches!